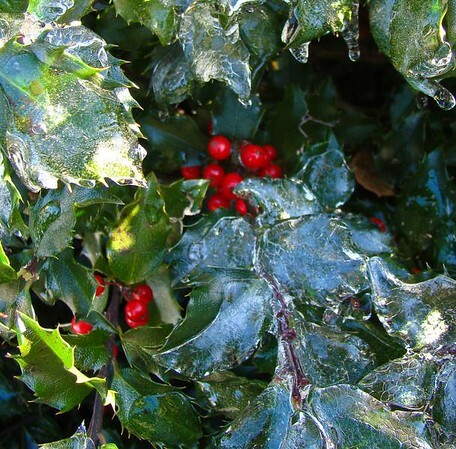 Holly, sharp as our failure to love, berries red as the blood that was shed, ice as cold as the world he came to save. We celebrate his birth. Merry Christmas! I saw this bush, covered in ice, in passing on the street, and immediately thought of it as a Christmas image. I took a few shots of the berries and leaves in their sheath of ice. The light was not ideal, as the bush was tight up against a house in deep shadow. Wide macro. F2.7 (wide open) @ 1/50th @ ISO 100. Just basic sharpening and Clarity in Lightroom. Cropped for effect. Because of the poor lighting, slow shutter speed, and hand-held macro, this just holds sharpness. Just. Enough. From the Winter Weather Gallery.